No matter how you’re feeling about the new president, one thing can be certain: changes in government – local, state and federal – have a huge impact on the nonprofit field. Whether those impacts are positive or negative, our sectors are intertwined and changes in legislation, leadership and government funding can and will have a trickle-down effect on nonprofit operations, philanthropy, volunteerism, services for vulnerable populations and so much more. 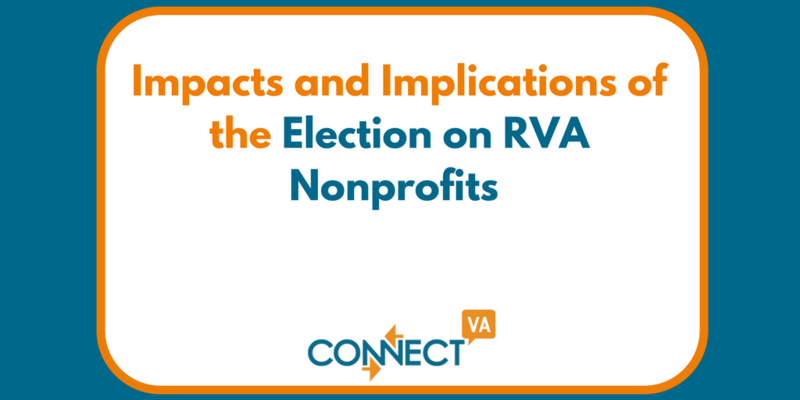 In January, The Community Foundation Serving Richmond and Central Virginia gathered alumni of its Emerging Nonprofit Leaders Program (ENLP) to discuss anticipated impacts and implications of the federal election on their work as nonprofit leaders. People may hoard their money ie put it under their mattress! A recent article by The Council of Nonprofits outlined the policy ecosystem, its effect on 501(c)(3)’s and two incredibly important facets that will play a big part in the charitable sector’s ability to advance their missions in the face of political uncertainty/change –1) organized efforts in advocacy at all levels of government to ensure elected officials understand the implications of their decision-making on nonprofits and 2) the response of Foundations and Grant-Making entities to funding advocacy-related activities, particularly at the state-level. We will be sharing more perspectives from the local nonprofit sector in the near future, so stay tuned! Please feel free to sign in and comment on how you anticipate the election of the Trump Administration on the work you do as it relates to the nonprofit sector!